Bangs work wonders if you want to hide a forehead blemish or an unruly cowlick. However, coaxing your fringe into the shape and style you desire and keeping it in place can be difficult on breezy days. If you want to avoid sporting an unwanted windblown look, you need to use hairstyling products and heated tools to stiffen your bangs. Keeping the bangs in place during high winds is difficult, but with some training and styling, your hairstyle will resist blowing around in mild to moderately windy conditions. Trim your bangs, if necessary, to get the style you want to wear. Super-short, wispy bangs may be more difficult to control, unless you have them trimmed at an angle. Consult with your hairstylist which bangs will work best for your face shape. Wash or wet your bangs to get better control during styling. If you allow your bangs to air dry, natural parts may create gaps or flips in the fringe. Comb the bangs to remove tangles. Separate long bangs with clips for easier styling. If you plan to wear the bangs parted to one side, clip one side back and away while you work on the other side. Apply hold gel or mousse to the bang or bang section. Use enough styling product to hold the bangs in place without making them feel hard or crunchy. A dime-sized amount should be enough. If you prefer to use hair wax, read the product label for suggestions on when to apply the product to your hair. Some waxes are for damp hair; others are for dry. Set a blow dryer on the "low" setting. 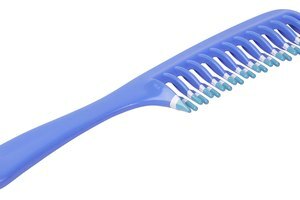 Place a round brush under the bangs with one hand, and hold a blow dryer with the other. Blow dry the hair while styling it into position. If wearing bangs in sections, blow dry one side and then the other. Curl the bangs under with a curling iron or flatten them down with a straightener. Heated styling tools help reinforce a wind-resistant shape. Arrange the hair where you want it with your fingers. Finish the bangs with a freeze or strong-hold hair spray. Use decorative bobby pins or clips to keep the hair in place when outdoors on windy days.